The EDITACTION preference lets you change how editing works, for when you only want to edit one of either the topic text, or the form attached to the topic. If EDITACTION is defined as text, then hide the form. If EDITACTION is defined as form, then hide the normal text area and only edit the form. The Edit and Edit wiki text buttons simply add ;action=text or ;action=form to the URL for the edit script, as appropriate. If you have defined EDITACTION you can still edit the topic content or the form by removing the ;action=form or ;action=text from the edit URL in the browser and reload. The SKIN must be overridden to "pattern01x01,pattern". You can safely set this in your SitePreferences before upgrading this extension. You must not manually install by extracting the archive directly into your Foswiki instance. You must use the Extension Installer. The installer will omit two files which are incompatible and must not be installed on Foswiki 1.1. Note: PatternSkin is included with Foswiki by default. Use the following instructions only if you are upgrading PatternSkin. 12 Feb 2018 V.6.12: Foswikitask:Item14633: Wrong language is used in the <html> tag. Foswikitask:Item14629: Certain topics can be overridden without permission. Foswikitask:Item14639: Operational topics in Main, Sandbox webs should be protected from editing non-admins. Foswikitask:Item14488: PatternSkin is missing "body" zone used by NatSkin and many extensions. Foswikitask:Item14556: clean up header area. 4 Apr 2017 V.6.10: Foswikitask:Item13883: Fix HTML errors in PatternSkinElements. 8 Feb 2017 v.6.09: Foswikitask:Item14315: Attachment count always shows latest revision when viewing prior versions. Foswikitask:Item14235: Sanitize some template fields. Foswikitask:Item14281: Cookie related changes. Inconsistent use of the domain and secure flags. Foswikitask:Item14286: PatternSkin*Navigation topics are broken, and difficult to tailor. Foswikitask:Item14092: Add hook to attach.pattern.tmpl to support attachment properties. Foswikitask:Item14145: Deprecation of beforetext/aftertext templates breaks compatibility with other skins. Foswikitask:Item14219: Add WebSideBar toggle cookbook. Foswikitask:Item14039: SkinBrowser is too slow, searches are too broad. 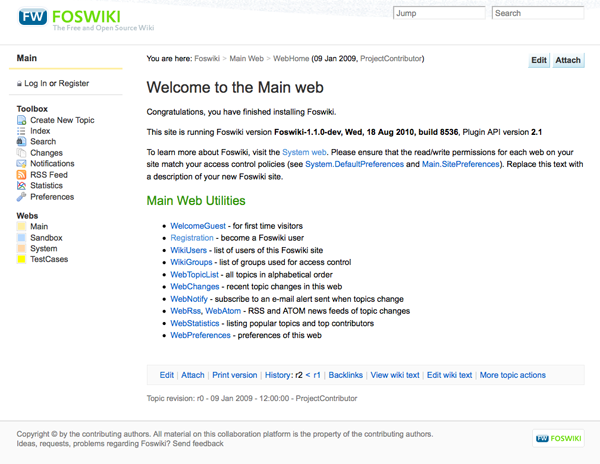 03 Dec 2015 v.6.04: Foswikitask:Item13885: Restore compatibility with Foswiki 1.1. 06 Nov 2015 v.6.03: Foswikitask:Item13814: Raw view should use monospaced font. Foswikitask:Item13619: Remove RevCommentPlugin hooks from from templates. 31 Oct 2012: v.6.00: Updated styles for forms and form elements. Simpler login screen. Theme "115" provides legacy support, Change to decimal versions. 26 May 2012: v.5.5.1: WebCreateNewTopicTemplate functionality moved to core. 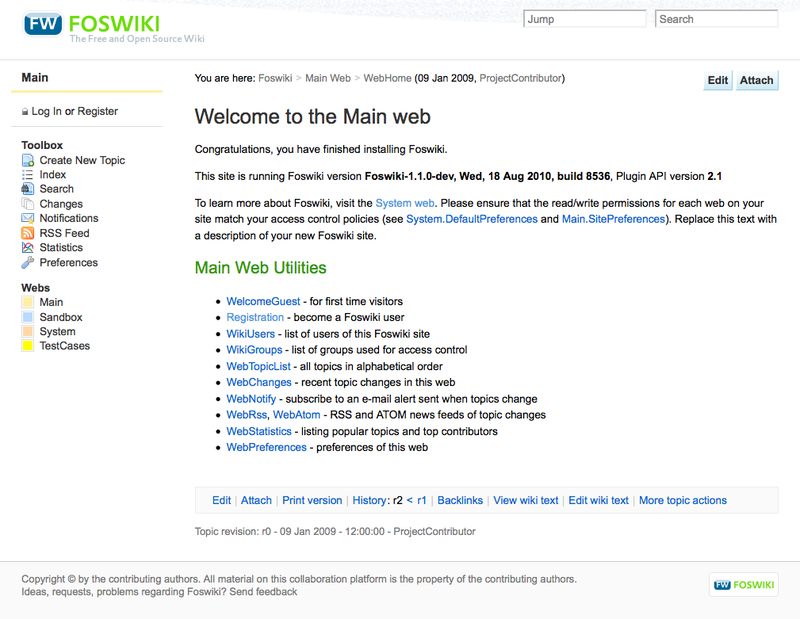 23 Apr 2012: v.5.5: Foswiki 2.0 release. Foswikitask:Item11783 - use new INCLUDE topic list feature. This change breaks compatibility with releases older than Foswiki 2.0.